This from The Heritage Foundation Blog [July 12, 2012]: "Today, the Obama Department of Health and Human Services (HHS) released an official policy directive rewriting the welfare reform law of 1996. The new policy guts the federal work requirements that were the foundation of the reform law. The Obama directive bludgeons the letter and intent of the actual reform legislation." It took decades for the American people to finally get welfare reform. 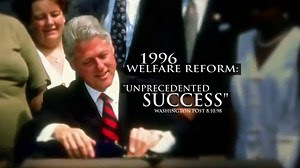 A Republican congress and Democrat President Bill Clinton finally made it happen in 1996. That bill made it a requirement for able bodies citizens to receive welfare payments to either be working or looking for work. Now in one sickening stroke of a pen, Barack Obama has illegally removed that requirement. In the bill there is no waiver on the work requirement part of the legislation. That was put in there so no future president could just gut the welfare reform bill by an executive order. But Barack Obama who has shown his disdain for the law and for his oath that he took to make sure that the laws of the United States of America are faithfully executed has done just that. Yes, this can be challenged in court and it will be won, but experts, like congressman John Campbell, R-CA [speaking on the Hugh Hewitt radio show] said it wouldn't be decided until after the election. Then it will be too late, as Obama is doing this for reelection purposes. Duane Patterson, the radio producer of the Hugh Hewitt show has been the first person I have heard to come up with the reason why president Obama is doing this now. He knows this will bring the wrath from Republicans and conservatives, but Obama doesn't give a damn. Duane Patterson [on last Friday's Hugh Hewitt radio show] [paraphrasing]: President Obama knows that if the unemployment rate is over 8% [which would have almost been a certainty] on election day, he will lose the election. What president Obama did, by removing the work requirement to receive welfare payments, will almost surely mean that tens of thousands of able bodied people will stop looking for work, as they will now be able to receive welfare payments without having to look for work. That means the labor force participation rate will be lowered, and that means the unemployment rate, that comes out every month, will be artificially lowered. I agree with Duane's assessment and think it is brilliant, because he is the only person who I have heard bring this up. It seems like a very reasonable theory to me. So, Obama has not only gutted all the work that it took for this country to finally get welfare reform, but in doing so he will increase his chances at reelection because we will almost surely see the unemployment rate artificially decrease as less people will be in the labor force. Jobs, what do jobs matter when Obama can do this to lower the unemployment rate without increasing substantially the number of jobs in America. The laws of this country, the constitution of this country mean little to this president if it gets in the way of his reelection. I pray to God the people of this country see through this man's sickening actions. We will no longer be the same exceptional, free market capitalist country if Obama receives another four years in office. For my daughter and the future of this country, I will do everything in my power to make sure Obama does not win reelection. Update-April 7, 2013: Unfortunately for this country, and for our future, this president did get re-elected and the results have not been good. An incredible 663,000 Americans stopped looking for work last month [i.e., left the labor force] bringing the total to a record 90 million Americans who are now not in the labor force and thereby are not counted in the unemployment rate. Even if the fact that welfare and food stamps are now so available because of the lessening of the rules for those able to get them is a small amount, I think these statistics give credibility to Duane Patterson's theory. By the way, there is no way of knowing for sure, but Obama's waiving of the welfare work rules, like Duane predicted, could have been a contributing factor why the unemployment rate did go below 8% just before the election and could have been the difference in him winning the election. On September 20, 2012 the House passed a resolution denouncing HHS for waiving the welfare work rules. This is a clarion call to the men and women of the United States of America: make a stand NOW. You must make a peaceful and civil stand now! When you stand you shall stand upon the Constitution. We The People must say enough is enough! We have had enough of the Executive branch going around the Legislative Branch. President Obama's motivations matter not. The results of his actions matter not. The methods that Obama has used to impose his will are unacceptable. We have a Law and limits on Executive power for a reason. Look at the DOMA Law, the Immigration issue, and not this welfare issue. The more people there are on welfare, the less money there is for everyone on the welfare rolls. By allowing the States to ignore the searching-for-work requirement yes more people will jump on the welfare rolls. This will mean less money available for them and the people already on the welfare rolls. Congressional action, President Obama and his administration has rewritten the law. In doing so he and his admin. have violated the checks and balances. They have made law without the consent of the Legislature. Thanks Phoenix for those comments. Obama is no leader. He is acting more like he is the king. We the people must end his reign. Thank you so much Don for those comments. Did you see my post on Romney's speech before the NAACP? I think that is the speech that turns the election around and will make him the winner.